If your taste leans to the glamorous end of the spectrum then you have stopped at the right floor. 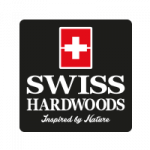 Swiss Hardwoods-Dark Grey -Gold is definitely modern, but still versatile enough to go with any traditional décor. The Beveled edging of this engineered floor give your space a very distinctive yet minimalist and contemporary feel. Gold undertones and brushed wood grain add a sense of coziness and warmth. While the oiled surface and matt finish of these extra wide semi solid planks Ooze sophistication, they are more durable and low maintenance compared to the solid wood floor. We enhance our floors natural beauty by using Rubio Monocoat® Oils for our surface treatments rather than use lacquers. An oil finished floor provides protection from both the inside and outside. Set upon a trendy golden base, this engineered floor has all the natural knots and patterns you desire in your hard wood floor.